The Orthodox Youth Mission Team consists of high school students from multiple Orthodox parishes in CT, NY and NJ. We will be participating in an Appalachian Service Project in July 2018. Serve with us. For information on volunteering as a youth or an adult leader, in our group or starting one within your parish, contact Father Luke or Susan Sulich at ssulich@yahoo.com or 203-746-6008. Make a tax-deductible donation to fund our trip. Just click on the donation button on this page or mail a check made out to Holy Trinity Orthodox Church (put OYMT in the memo) to Holy Trinity Orthodox Church, 74 Joes Hill Road, Danbury, CT 06811, c/o Susan Sulich—Team Leader. Pray for us. Please pray for our mission group, the families we will serve, the ASP staff and the ministry of ASP as a whole. We want to say a great BIG thank you to all of you for helping fund our Appalachian Service Project Mission Trip this past summer to Hanover, WV. 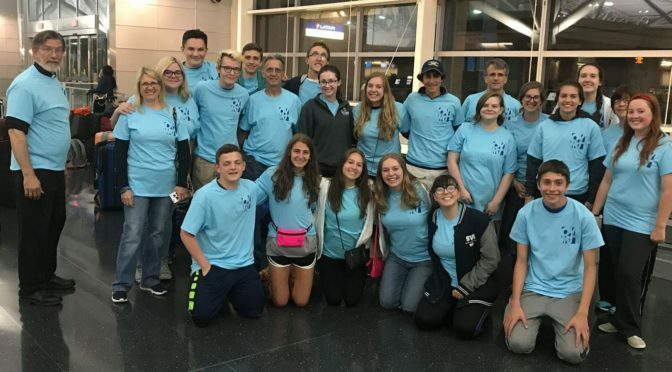 Your financial contributions, prayers and other support paid off in a wonderful trip that blessed us the servers as much as those that we served, as you will see by the reflections of the youth in our newsletter. If you are unable to attend a session in person, please take a look at our photo gallery on our web site. Plans are underway for a July 2017 trip with the Orthodox Christian Mission Center (OCMC) to ALASKA!! If you know of anyone who may be interested in joining us, please have them call 203-746-6008 or email ssulich@yahoo.com by October 30. This is the place for team members to go for the latest info on what’s happening with our service projects. You can also find forms here or other hand outs from the meetings, and pictures. Visit often! Only 3 training sessions to go!! !